For every two people detained in immigration enforcement operations, one child is left behind, according to a recent report, “Paying the Price: The impact of Immigration Raids on America’s Children,” released by the National Council of La Raza and the Urban Institute. The report finds that two-thirds of these children are U.S. citizens, and notes that most are under age 10. “Five million children living in the U.S. have at least one undocumented parent,” said Rosa Maria Castañeda, co-author of the document and researcher with the Urban Institute. “These are the most vulnerable in society,” she said. The study points out that immigration raids directly affect children’s psychological, educational, economic and social well-being. Such raids greatly impact immigrant communities, school systems, social service providers and religious institutions, which have acted as first responders for many families during immigration arrests. 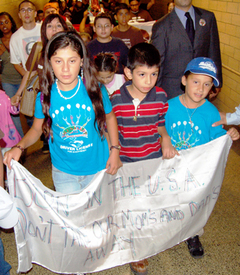 Immigration raids, says the study, create economic distress and emotional trauma for children. Urban Institute researchers studied three communities that experienced large-scale worksite raids by U.S. Immigration and Customs Enforcement (ICE) agents within the past year: Greeley, Colo., Grand Island, Neb., and New Bedford, Mass. A total of 912 people were arrested and 506 children were directly affected. Many schools, child care providers and extended families were also affected. In each case they served as important safety nets for children whose parents were detained. dropped off to empty homes or left at school overnight. The report criticized ICE’s processing and detention procedures, which routinely deny detainees telephone access, and the holding of many detainees outside their home states, making it difficult for those arrested to contact their families or other caregivers to arrange for child care. The majority of children, after ICE arrests, remained with a second parent. However, in Grand Island, 17 percent of children affected had both parents arrested. Resources of extended families and friends were depleted quickly, and support from nonprofit groups generally lasted only three or four months, yet some parents remained in detention for up to six months, the report noted. Many children experienced emotional trauma from their parents’ sudden absence, often personalizing the cause of separation and feeling abandoned. Many remained fearful that their other, non-detained parent could be abruptly taken away from them. For these reasons and others, many national immigration rights groups have called for a moratorium on all ICE raids and deportations. In her research, Castañeda spoke with 30 immigrant families. One parent told Castañeda that her 10-year-old son was fearful and showed signs of anxiety, especially when police sirens were heard outside their home. He ran to his room and hid, the parent said. In another case, a child was extremely confused, not understanding why his father had to go away because they came to the United States to have a better life and not to be separated. In all three cities, immigrant families hid in their houses and were reluctant to open the door to visitors offering assistance for weeks after the raids. Mental health experts noted that the parents’ fears and the events surrounding the raids led to the children having depression, post-traumatic stress disorder, separation anxiety and suicidal thoughts. The report includes a series of recommendations for policymakers, local officials, service providers and the ICE to ensure that children are protected when raids occur. For example, the report says ICE should assume that children will be affected whenever adults are arrested in worksite raids, and a consistent policy should be arranged when handling detained parents. Also, it says Congress should provide oversight of immigration enforcement and ensure that children are protected with adequate resources for schools and local agencies that respond to children’s needs. Schools should also develop safe places for children to go in the event of a school-hours raid, the report says. Finally, the report urges social service and other public agencies to prepare plans to respond to ICE raids and develop outreach strategies to assure parents and other caregivers that it is safe to seek emergency assistance and support for children. In light of the report, NCLR has asked Congress to hold hearings as soon as possible regarding the status of children in the aftermath of raids. Castañeda said the issue is nonpartisan, and children’s needs should be the fundamental consideration.